The Suspense TV show was a 30 minute anthology drama series on CBS about people in situations where their lives or the lives of a loved one were in danger. There was a Suspense Radio Show on the air for 20 years! It won a "Peabody Award" and a special citation from the "Mystery Writers of America". In fact, the radio show began seven years before the TV show and lasted eight more years after the series left the air! Those who experienced both often stated that the excitement of the Suspense episodes was better on the radio as one's mind can imagine the fear and anguish from the radio much better than television can show it. The TV show, like the radio program was broadcast live. In 1964, the Suspense TV show reappeared with Sebastian Cabot as host for a very short season and those episodes were filmed, not live. During that time, the only new episodes were broadcast from March to June of 1964. Suspense continued until September of 1964 but the episodes starting in July were actually re-runs from the "Schlitz Playhouse of Stars (1951)". As on the radio version of Suspense, there were usually top name guest-stars from both Broadway and Hollywood. Some of them included Lloyd Bridges (Sea Hunt), Jackie Cooper (Hennesey), John Carradine, John Forsythe (Charlie's Angels), Arlene Francis, Eva Gabor (Green Acres), Boris Karloff (Thriller), Grace Kelly, Cloris Leachman (Phyllis), Peter Lorre, E.G. Marshall (The Defenders), Basil Rathbone and even future new broadcaster Mike Wallace (60 Minutes)! 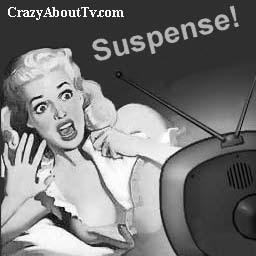 The Suspense TV show was nominated for an Emmy in 1954 for "Best Mystery, Action or Adventure Program". Bernard Herrmann composed the theme song for "Suspense". He was also the show's conductor from 1940 to 1943. He also scored Orson Welles' first work on the radio, "War of the Worlds". He wrote the scores for many hit movies including "Citizen Kane", "Psycho" and "Taxi Driver". He died just 2 hours after finishing the score for "Taxi Driver". Many of the Suspense episodes were adapted from stories written by classic authors such as Charles Dickens, Edgar Allen Poe and Robert Louis Stevenson. "Well calculated tales to keep you in suspense." Thank you for visiting our Suspense TV show page!